40 Million Credit Cards — III. In the first panel, woman 1 speaks. Woman 1: You know how anyone can easily vandalize a Wikipedia article? Woman 1: This is by design. Woman 1: The liberal editing policy lets Wikipedia improve rapidly. The next panel takes the form of a fantasy bubble. Inside the bubble a man sits at a computer. Man at computer: Somebody vandalized this Wikipedia page. No problem, I'll revert it. Man at computer: Done! Now I'll improve this article. The next panel begins with the narrator's observation. Narrator: But does it make sense to run a payment system that way? A woman 2 is on the phone. Woman 2: Sorry to bother you. I see credit card charges that I don't recognize. No bother, ma'am. Undoing charges is my full-time job. Which ones are unauthorized? Woman 2: I've been shopping so much I can't be sure. Doesn't your computer know? Voice from phone: No, ma'am. That's your responsiblity. 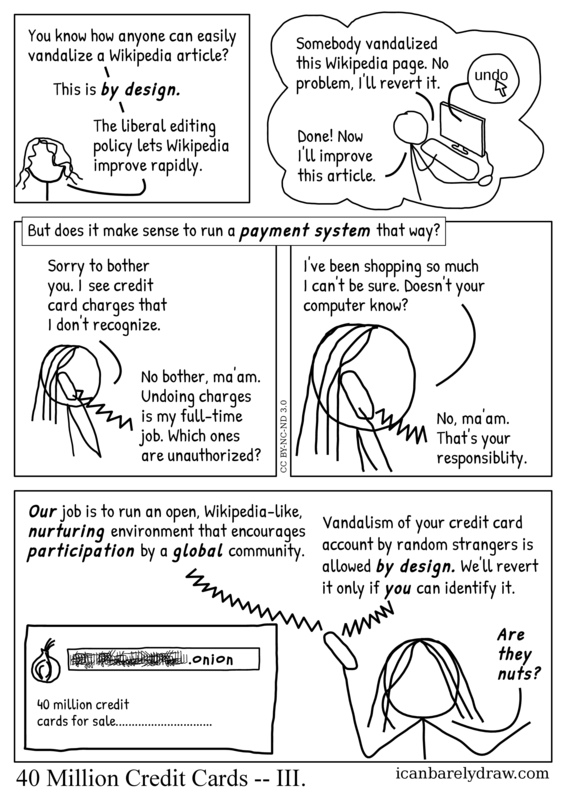 In the next panel, a computer screen is seen that shows an indecipherable string ending with the legible characters: .onion. Also on the screen is a small image resembling an onion. Woman 2 has the phone. Voice from phone: Our job is to run an open, Wikipedia-like, nurturing environment that encourages participation by a global community. Voice from phone: Vandalism of your credit card account by random strangers is allowed by design. We'll revert it only if you can identify it. Woman 2 spreads her arms and brandishes the phone. Woman 2: Are they nuts? Title: 40 Million Credit Cards -- III.